Welcome to our elegant and lovely 2 bedroom 1 bathroom single story vacation rental home located just 7 minutes from the University of Oregon and downtown Eugene. The warm European colored walls and inviting French Provincial décor are welcoming & relaxing and invite you inside to unwind and enjoy a lovely vacation from the moment you step into the home. The outside of the home has been completely renovated including new siding, new windows, new paint, and a new roof. 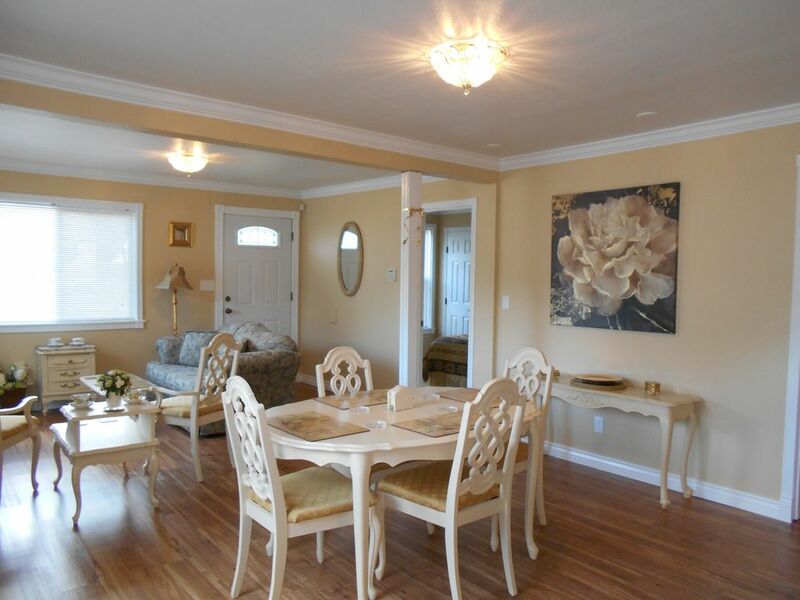 The inside of the home has also been completely renovated from top to bottom. This property will accommodate a maximum of 5 Guests only. We do count children, of any age, as a Guest in the total Guest headcount, thank you. If you are looking for a nicely appointed, affordable, very clean and for an elegant home -- this is it! This is a wonderful vacation rental property for a small group, family, or a pair of couples who are visiting the Eugene, Oregon area and prefer to stay in a vacation rental home versus staying in a hotel room(s). This home is conveniently located on the Eugene/Springfield border just 4.2 miles from the University of Oregon and from Downtown Eugene. It takes approximately 7 minutes to drive from this property to the University of Oregon. All 4 of our single story homes, and all 3 Waikiki condos are dedicated VRBO properties & none of them are on the market for sale, so you can be assured that all of our properties will be awaiting your arrival. The home has a new Mitsubishi air conditioning & heat split system for your comfort as well as an additional heat source in both of the bedrooms. The home has an installed security alarm system with each vacation renter’s personal & individual access codes set upon your arrival. DISCOUNTS: Discounts are offered to our returning Guests at any one of our 7 VRBO properties. REVIEWS: We have hundreds of outstanding 5 star reviews that we have received from former Guests who have chosen to stay at any of our other lovely VRBO properties. USE / RESTRICTIONS: Due to Owners allergies, No smokers, no animals, & no pets are allowed inside or outside of the property at any time. Please be advised that in consideration of ourselves and our future Guests, there is a strict No Smoking, No Animals & No Pets policy at this property, either inside or outside of the home, therefore, we do not rent to smokers, or to any Guests with animals or pets. Additional Guests, not listed on the Rental Agreement, are only allowed at the property, at any time, day or night, with our prior written permission. PAYMENT REQUIREMENTS: To secure a reservation both a signed Rental Agreement & payment in full is required. Book quickly, & pay safely with full confidence at any of our 7 VRBO properties. We have been advertising our vacation rental properties on VRBO & HomeAway since 2011 & have an excellent reputation with them. The kitchen has new customize designed maple cabinetry, a new kitchen sink, a new refrigerator, a new stove/oven, a new microwave, a new dishwasher & fully stocked cabinets for your cooking needs. The bathroom also has new custom designed maple cabinetry, a new bathtub/shower combo, a new sink & a new toilet. We have used a combination of French provincial furniture, as well as other decor inspiration for the finish out of this vacation rental home. There is a sofa and a lovely tea/coffee sitting area for relaxing in the Living Room area. There is a dining room table that seats five in the Dining Room area. This home has crown molding and elegant mill work around all of the doors and windows for an elegant & lovely finish out for your enjoyment. We have elegant chandelier ceiling mounted style lighting in the 2 bedrooms, Living Room & Dining Room as well as in the Kitchen. There is a Queen sized bed in the Master Bedroom #2 and there is a Full/Double sized bed in Bedroom #1. There is also a Twin sized air mattress bed with linens that is fully inflatable and deflatable by plugging it into the wall. There is a washer & dryer in the walk-in Laundry Room. There are plenty of toys, books, puzzles and baby things for children as well as a pack-n-play, infant holder, and a high chair. There is a fully fenced back yard with lawn furniture, and a fully fenced front yard with pretty flowers, plants & trees. AVAILABILITY OF OUR OTHER VACATION RENTAL HOMES IN THE AREA: We may also still have availability for your requested stay dates at one of our other 3 current vacation rental homes in the Eugene, Oregon area and the photos are online for your review. We have our VRBO Listing # 473055 which is a 3 bedroom, 2 bathroom home located in Creswell, a suburb of Eugene, & just a minute’s drive away from Listing # 412786 . We have our VRBO Listing # 356627 which is also a 3 Bedroom, 2 Bathroom home in West Eugene. We have our VRBO Listing # 412786 which is a 5 Bedroom, 3 Bathroom home located in Creswell, a suburb of Eugene, & just a minute's drive away from Listing # 473055. Our other 3 vacation rental properties take approximately 12 to 15 minutes to drive to the University of Oregon and Downtown Eugene from where they are located. We also have 3 VRBO Listings # 372168, # 428708 & # 878766 which are vacation rental condos with full kitchens in Waikiki, Hawaii. $100.00 per night base rate for 1 to 4 Guests. $25.00 fee per person per night for 5th Guest, calculated only after the first 4 Guests. Adults, Children & Infants, regardless of age, are all counted towards the maximum of 5 Guests allowed at this property. A maximum of 5 Guests (including children of any age) are allowed at this property. We have 3 larger vacation rental homes for you, if you have more than 5 Guests in your group. Our Weekly Rate is $630.00. Our Monthly Rate is $2,250.00. $90.00 for 1 to 4 Guests. $100.00 for 5 Guests. $250.00 fully refundable security damage deposit returned within 2 weeks of your departure. Special Event Pricing &/or any extended minimum night stay requirements apply for some Special Events such as June Graduation & NCAA each year. Rates are subject to change prior to a secured reservation. If you are looking for an elegant and affordable vacation rental home, this property will meet your needs. We take great pride in how our 4 VRBO vacation rental homes in Eugene & the Eugene area as well as how our 3 VRBO condos in Waikiki are decorated and in how they are well appointed for our Guests. We enjoy providing fully furnished homes and condos that have been specially designed to be VRBO's year round to meet the needs of our Guests traveling through the area, or coming to visit family and friends, or coming to get their children set up at the University of Oregon. This property is located in Springfield just 4.2 miles (7 Minutes) to the University of Oregon, Autzen Stadium & Downtown Eugene. This home is a single level home with an open floor plan in a well-established neighborhood made up of friendly homeowners. Springfield is very peaceful and very beautiful!! You cross the lovely river each time you enter Eugene. This is a great central area to be able to see and do everything in Eugene as well as activities outside of Eugene. Many Springfield residents commute the short and lovely drive to Eugene to work versus living right in busy Eugene. We enjoy offering quality, elegant & affordable vacation rentals to visiting Guests at all 7 of our VRBO's: 4 of which are single family homes one in Eugene, Listing # 356627 (3 Bedroom, 2 Bathroom, 2 Car Garage Home); and two homes in Eugene's suburb, Creswell, Listing # 412786 (5 Bedroom, 3 Bathroom Home), and Listing # 473055 (3 Bedroom, 2 Bathroom, 2 Car Garage Home) and Listing #884960 in Springfield, next to Eugene (2 Bedroom, 1 Bathroom Home); and 3 of which VRBO's are condos located in beautiful Waikiki, Hawaii. We make certain that all of our vacation rental properties are decorated for the discerning travelers and are very well appointed. We pride ourselves in our numerous 5 star rating reviews from our former Guests at all of our VRBO's and are especially delighted when our Guests continued to be so pleased with all of our places. We also pride ourselves in how our homes are maintained and cleaned extremely thoroughly each time in between each of our Guests leaving and arriving. We specifically chose this property as a VRBO because it is outside of the congested area near downtown and near the University of Oregon so that our Guests can be assured that parking is never a concern, and loud parties are not a problem since our 4 VRBO homes are all in well-established subdivisions with friendly homeowners owning and living in the adjacent homes. Very close to University of Oregon & to downtown Eugene. This property is ideal for Guests looking for a lovely alternative to a hotel room. Affordable Elegance! offers Guests an entire home with 2 bedrooms and 1 bathroom at less than the cost of a small hotel room, or multiple hotel rooms. The kitchen is a wonderful way to save money by not having to eat every meal out in restaurants and gives everyone a chance to be together at the same time. There is a PaknPlay, baby holder & high chair for children. There are also some toys, puzzles, games & lovely books for children of all ages. This property is ideal for rental groups that may be on a budget who want an exceptionally clean, comfortable, pet & smoke odor free home that is elegantly & tastefully decorated all for a great price. This home is great for small families or 2 couples for sporting events so close to UofO, vacations, seminars, work and more! The large fully fenced backyard is very private and has a BBQ with cooking utensils & outdoor seating for your outside enjoyment. When you leave the property take a turn on "Main Street" headed out of town towards Eugene and within 2 minutes you will be crossing the bridge over the lovely river into Eugene. It is just 4.2 miles to the University of Oregon, Autzen Stadium and Downtown Eugene. The scenery around here is just fantastic & in a short drive out "Main Street" away from Eugene you will be driving all along the gorgeous McKenzie River route. Bathroom has new granite counter top, new Maple Cabinetry, new fixtures, new toilet, new romantic style scone lighting and a new bathtub/shower combination. Linens, blanket & comforter are provided for queen and double beds in Bedroom #1 and Bedroom #2. Linens & blankets are provided for twin air mattress bed. Washing machine and dryer are inside home in walk in Laundry Room. There is a long driveway at our property as well as street parking. Towels of all sizes (bath, hand & face cloths) are provided for 5 Guests. Living Room sofa, conversation tea settings with 2 chairs & accent tables as well as additional dining room seating. French style place settings, casual and formal (crystal) glassware, crystal barware,pots & pans, baking pans, mixing bowls, casserole, ets. The cabinets are well stocked for your cooking needs. Brand new kitchen with new Maple cabinetry, fridge, stove/oven, microwave, dishwasher & small appliances for preparing meals at your home away from home. Kitchen is fully stocked & well-appointed. Dining room table seats 4-5 Guests. High chair for children. There is portable CD Player with CD's. Adult & chldren's games & deck of cards. CD's and a small Karaoke with Karaoke CD's as well. There are toys, puzzles & games at this property. There is a front and back yard both of which are fully fenced with back yard lawn furniture. There are public tennis courts a few blocks away from this home. There are a number of public golf courses in the area. Our vacation rental home is located 4.2 miles from the University of Oregon, Autzen Stadium and Downtown Eugene. A signed Rental Agreement & payment in full is required to secure a reservation. $100.00 Standard Pricing Rate per night for the first 1-4 Guests. $25.00 per person per night for 5th extra Guest, calculated only after the first 4 Guests. Adults, Children & Infants are all counted towards the maximum of 5 Guests allowed at this property. A maximum number of 5 Guests (including children of any age) are allowed at this property. We have 3 larger vacation rental homes for you, if you have more than 5 total Guests in your group. Our Weekly Rate is $630.00. Our Monthly Rate is $2250.00. Cleaning Fee:	$90.00 (1-4 Guests) or $100 (5 Guests) Cleaning fee is based on # of Guests (VRBO.com only allows 1 cleaning fee to be entered, therefore, check your Guest count & match to our cleaning fees sliding scale listed above based on your group size for an accurate quote). Security/Damage Deposit:	$250.00 (Fully refundable & returned to Guests within 2 weeks after departure date). Special Event Pricing applies for Graduation, NCAA, Track & Field Events, Football Games, & may apply for other Special Events. Ask owner for details regarding any Special Event Pricing &/or any extended minimum night stay requirements. Rates are subject to change prior to a secured reservation.